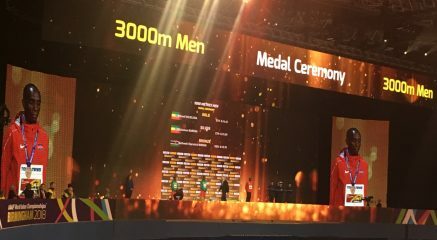 4th March 2018 – At the IAAF World Indoor Championships in Birmingham, England, Bethwel Birgen (KEN) earned his first global medal with a bronze in the men’s 3000m. Having won the IAAF World Indoor Tour last year over 1500m and also the same event in Glasgow the previous week Bethwel chose to step up to the 3000m at the Championships and will feel now that decision was vindicated. After a slow opening half in the final the pace finally gathered in the final kilometre with places chopping and changing the entire time. Bethwel was able to show good speed in the final 200m though and claimed a hugely deserved and popular medal. Fred Kerley (USA) also won his first medal as he the led off the American quartet that claimed silver in the men’s 4x400m and with a split of 44.84 seconds recorded the fastest ever opening leg in an indoor relay. Indeed, it took a new World Indoor Record by the Polish team to claim the gold. Hellen Obiri (KEN) ran well to take fourth place in a high quality women’s 3000m on the opening night and Winny Chebet (KEN) was fifth in the women’s 1500m. Both ladies will now head to next months Commonwealth Games on the Gold Coast of Australia looking for medals. Vincent Kibet (KEN) made his second successive World Indoor final over 1500m. Bralon Taplin (GRN) was harshly disqualified after he won his heat of the men’s 400m in a Championships that unfortunately may well be remembered for the number of disqualifications as much as for the athletics!